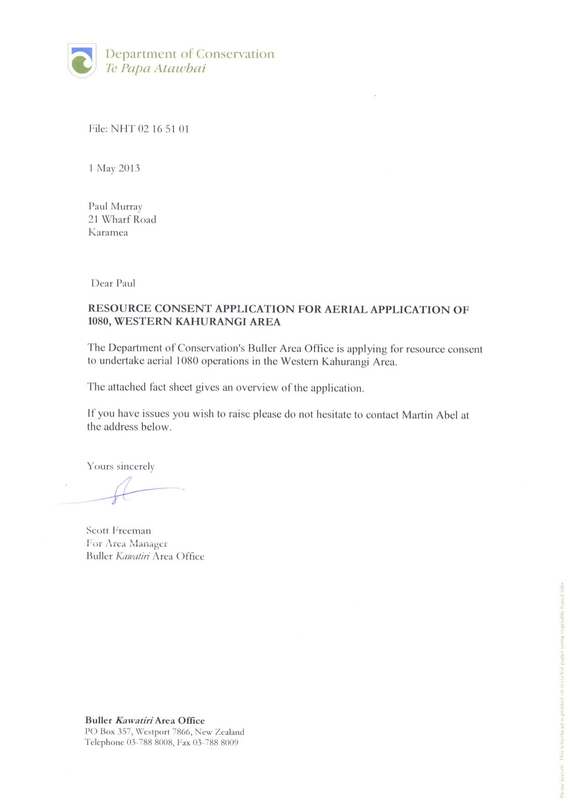 The following letter was sent out to residents of the Northern Buller district regarding proposed resource consent application by the “Department of Conservation” to permit the government body to aerially poison 113, 699 hectares of the Kahurangi National Park. The letter invited comment…below is mine. 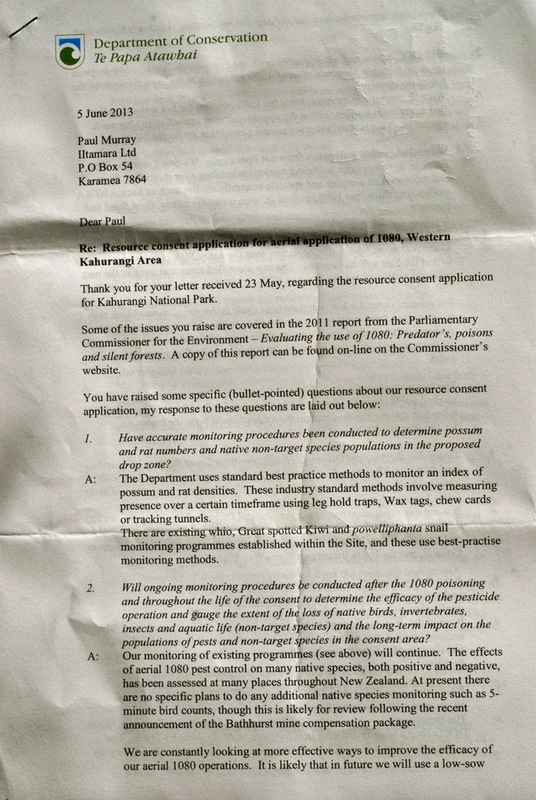 I received a letter from Buller Kawatiri Area Manager Scott Freeman on May 17, 2013 (letter dated May 1) regarding the application by the Department of Conservation (DOC) for a resource consent to conduct an aerial 1080 poison operation covering 113,699 hectares in the Western Kahurangi area. 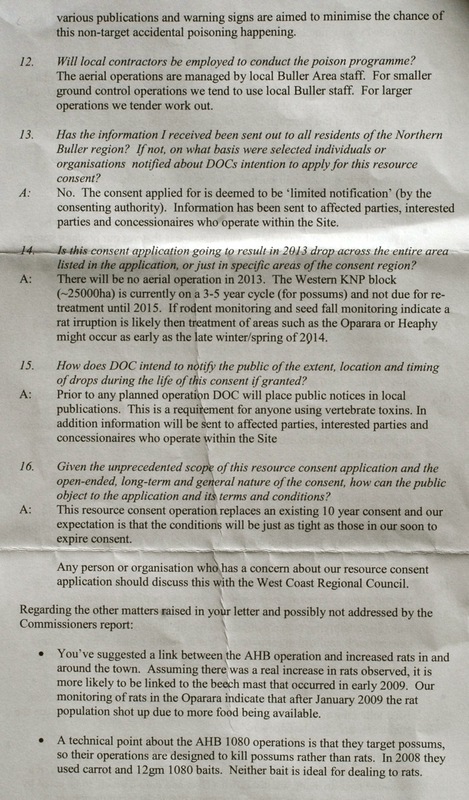 The letter invited me to raise issue with the resource consent application by contacting you. I have numerous concerns about the proposed aerial 1080 poison and have a number of questions for you regarding the drop. I am a Karamea tourism business operator. I also have a permaculture farm in the region that has been pesticide free for eight years. I feel that the proposed 1080 operation by the DOC will compromise both the marketing strategy for my tourism businesses and also the pesticide-free status of my permaculture farm. Violates the nation’s “Clean Green/100%Pure” brand that is used to promote New Zealand internationally. 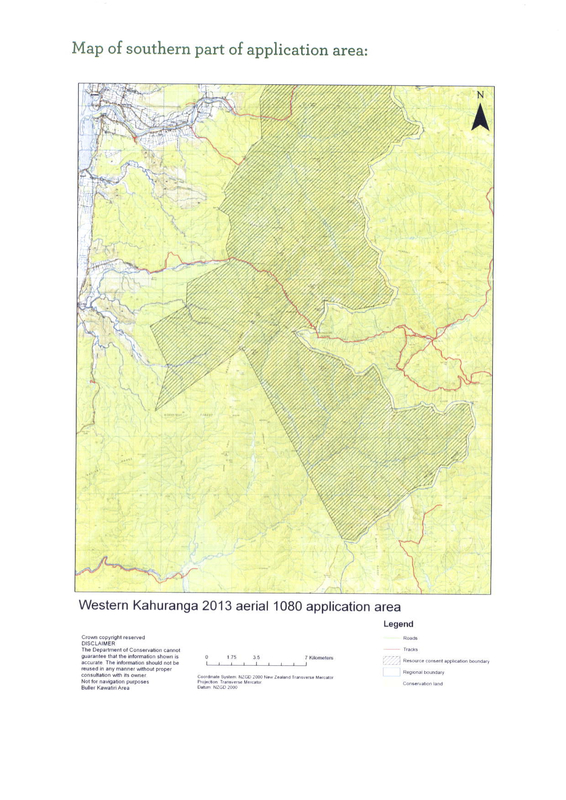 Myself and many other Karamea residents publically opposed the aerial 1080 operation conducted in the Kahurangi National Park by the Animal Heath Board in 2008 and my position and that of the other residents on the issue has not changed. We find aerial 1080 pesticide operations to be an unacceptable solution to possum control and evidence suggests it creates a raft of other problems in the forest. Scientific studies show that rat populations explode after aerial 1080 operations and that was certainly the observation of people living in Karamea following the 2008 poison programme and rat numbers in and around the town are still high in my experience. 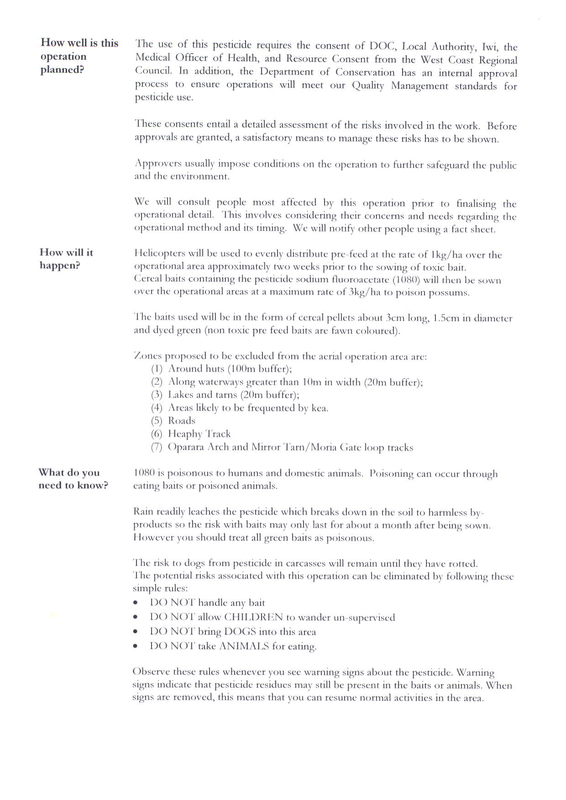 Prior to the 2008 1080 poisoning, I hadn’t seen a rat in the town, however, soon after the aerial pesticide operation, rats began to invade our homes and businesses. It’s ironic that the rats you say are one of the targets of the proposed 1080 programme are resultant from the last poison operation. Poisoning vast areas of the national park leads to an elevation in rat numbers in the poison zone. Rats quickly repopulate the poisoned forest and come into an area devoid of predators and with an abundant food supply and their numbers are shown to surpass population levels that existed in the area prior to the pest-control operation. This is supported by scientific evidence in a study published in the Landcare Research Kararehe Kino vertebrate pest research report (December 2008). 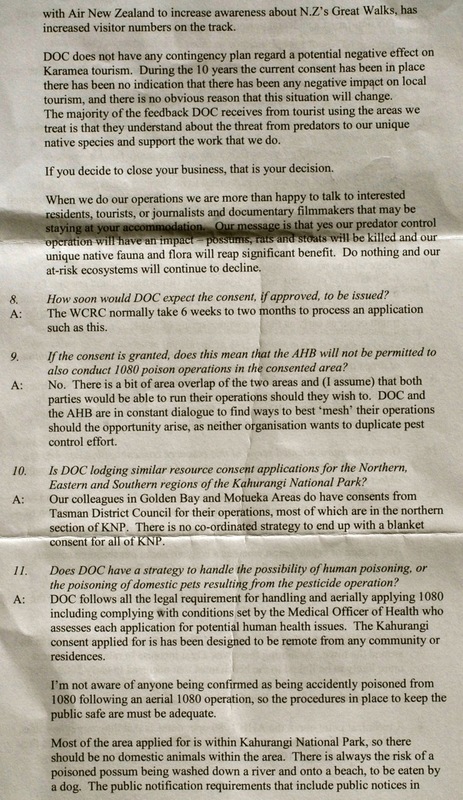 Following the experience of the 2008 Animal Health Board (AHB) drop and the associated negative impact on and restriction to my business trade, I request DOC give me advanced notice of any scheduled similar aerial 1080 poison operations in the Kahurangi National Park so I can inform all potential customers that my business will be closed for the duration of the programme and for at least one month following to ensure all risk associated with the baits has passed and the pesticide has broken down in the soil to “harmless by-products,” or until all green baits have decomposed. I consider this the only responsible action I can take to protect the reputation of my business, honour my marketing strategy––in which I actively invite people from all over the world to visit the pristine, pure, clean, green and scenically beautiful environment in the Karamea region––and prevent the risk of possible exposure to the poison of guests staying at my accommodation facilities and utilising my transport service. I have established good standing as a professional eco-tourism operator over the past 10 years and I consider that the proposed aerial 1080 operation is a serious threat to that hard-earned reputation. If my business continues to host guests during and immediately after the 1080 poison programme, I risk my business marketing strategy being considered specious and hypocritical given that they way I promote my business is contrary to inviting people to come and visit a poisoned forest. There will be a significant financial loss incurred by my business by closing for which I reasonably expect to be compensated. Would you please provide me with information as to how I might file a business compensation claim with the Department of Conservation so that I might recover the losses incurred resulting from the interruption to my business and restriction to trade? I also intend to offer my incapacitated accommodation facilities to domestic and international journalists and documentary filmmakers for free during the period of the drop and beyond so that they might have and opportunity to cover the programme thoroughly and report on the impact the DOC-sponsored poison operation has on the people of Karamea and the ecology of the Kahurangi National Park. I also have several questions ahead of the application for resource consent to conduct this unprecedentedly large pesticide programme in the Western Kahurangi area. Have accurate monitoring procedures been conducted to determine possum and rat numbers and native non-target species populations in the proposed drop zone? 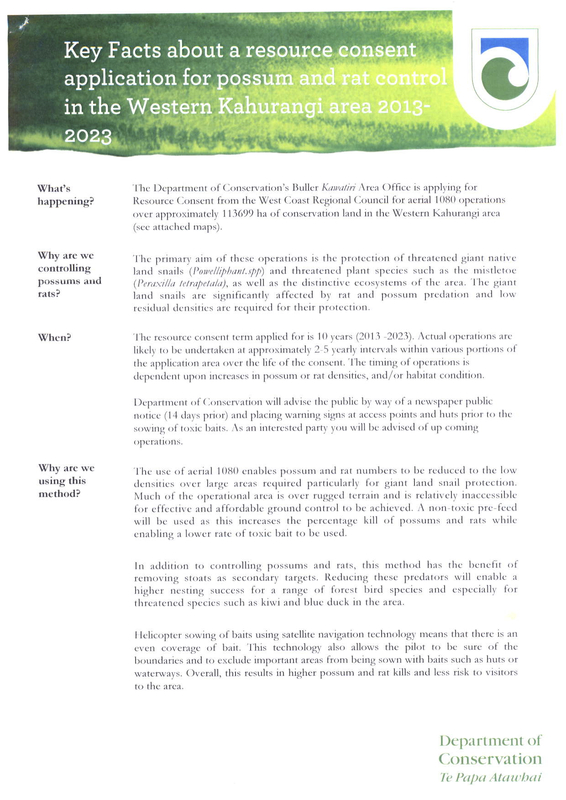 Will ongoing monitoring procedures be conducted after the 1080 poisoning and throughout the life of the consent to determine the efficacy of the pesticide operation and gauge the extent of the loss of native birds, invertebrates, insects and aquatic life (non-target species) and the long-term impact on the populations of pests and non-target species in the consent area? Will DOC monitor of water quality in the poison zone following 1080 drops to measure possible contamination of water resources in the area throughout the life of the consent? What is the projected cost of the operation over the life of the consent? 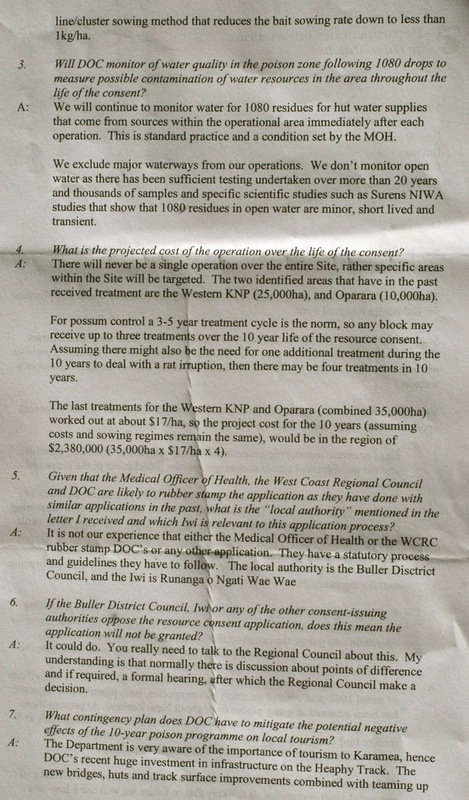 Given that the Medical Officer of Health, the West Coast Regional Council and DOC are likely to rubber stamp the application as they have done with similar applications in the past, what is the “local authority” mentioned in the letter I received and which Iwi is relevant to this application process? If the Buller District Council, Iwi or any of the other consent-issuing authorities oppose the resource consent application, does this mean the application will not be granted? What contingency plan does DOC have to mitigate the potential negative effects of the 10-year poison programme on local tourism? How soon would DOC expect the consent, if approved, to be issued? If the consent is granted, does this mean that the AHB will not be permitted to also conduct 1080 poison operations in the consented area? 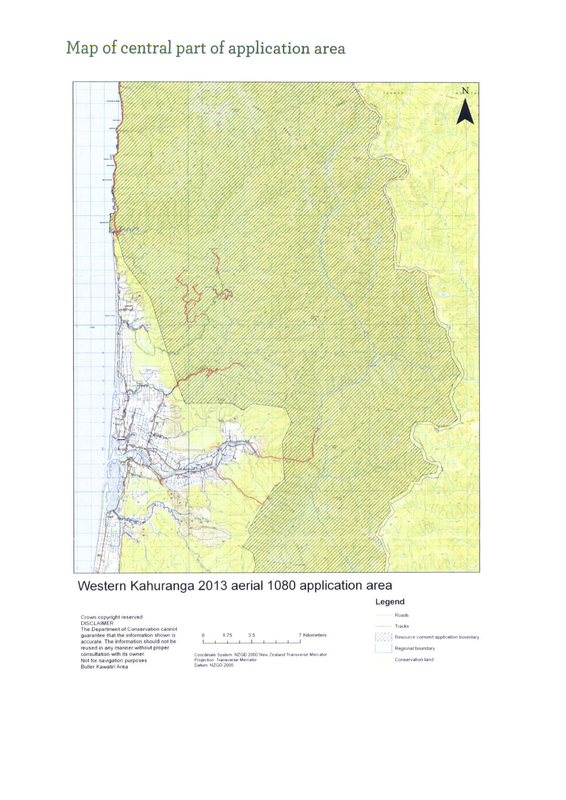 Is DOC lodging similar resource consent applications for the Northern, Eastern and Southern regions of the Kahurangi National Park? Does DOC have a strategy to handle the possibility of human poisoning, or the poisoning of domestic pets resulting from the pesticide operation? Will local contactors be employed to conduct the poison programme? Has the information I received been sent out to all residents of the Northern Buller region? If not, on what basis were selected individuals or organisations notified about DOC’s intention to apply for this resource consent? Is this consent application going to result in a 2013 drop across the entire area listed in the application, or just in specific areas of the consent region? How does DOC intend to notify the public of the extent, location and timing of drops during the life of this consent if granted? Given the unprecedented scope of this resource consent application and the open-ended, long-term and general nature of the consent, how can the public object to the application and its terms and conditions? I am not opposed to pest-control and appreciate that national park management is a considerable challenge for DOC, but ask that any pesticide use specifically target the pest in question. I strongly oppose broad-scale indiscriminate aerial poisoning of vast regions of DOC administered land in the name of New Zealand and New Zealanders. I appreciate your consideration of the issues I have raised and hope to receive a full response to the questions I have asked in this letter. Should you have any questions, or require more information, please e-mail, or call me any time. 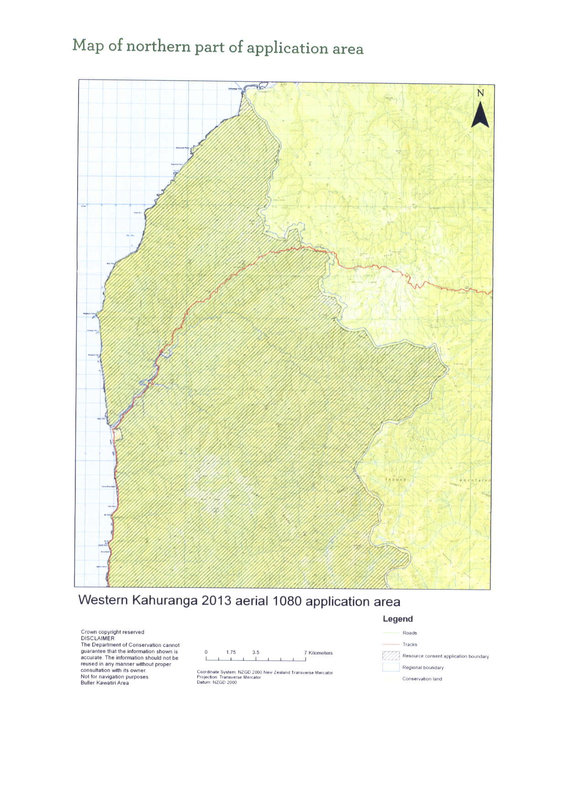 This entry was posted in 1080, Agriculture, Buller District Council, Business, Department of Conservation, DOC, Economics, Education, Environment, Heaphy Track, Historical, Kahurangi National Park, Karamea, LivinginPeace Project, Money, Mountain Biking, MTB, New Zealand, Oparara, Permaculture, Politics, Product review, Social Commentary, Sustainablity, Tramping, Travel, West Coast and tagged 100% Pure New Zealand, 1080, Clean Green New Zealand, Department of Conservation, DOC, Economics, Environment, Kahurangi National Park, karamea, New Zealand, Pest Control, Poison, possums, Sodium monofluroacetate, Sustainability, Tourism, toxin. Bookmark the permalink. I hiked the Heaphy Track in 1985 with my friends Dave and Johnny. An orchestral symphony of bird life had a melodious crescendo that would put the 1812 Overture to shame! The Department of Conservation’s Final Solution has no place in a clean green New Zealand! Proponents of the poison programme will decry this statement as “anecdotal” and state that it “lacks scientific verification” and is therefore “irrelevant.” However, there are so many similar observations from bush walkers, bird watchers, prospectors, hunters, possum trappers, explorers, trampers, mountain climbers etc, etc…people who have spent significant time actually in the bush that it is getting more difficult for the senior DOC administrators and government officials responsible for the instigation of the poison programmes, who largely spend time in the offices in Wellington to ignore. People like Jan Wright, the parliamentary commissioner for the environment, who wrote a poorly researched report titled “Evaluating the use of 1080: Predators, poisons and silent forests” that actually advocated using MORE 1080 poison…get out and actually have a look in the bush Jan! The Listener? Really?….More like the Gossiper! No pest control in the Kahurangi National Park aye? That statement is an insult to the hard-working pest controllers working in the Kahurangi, the Department of Conservation staff, the people living on the fringes of the park, the tax-payers of New Zealand who fund the millions of dollars used for this supposedly non-existent pest control…and to the pests themselves! 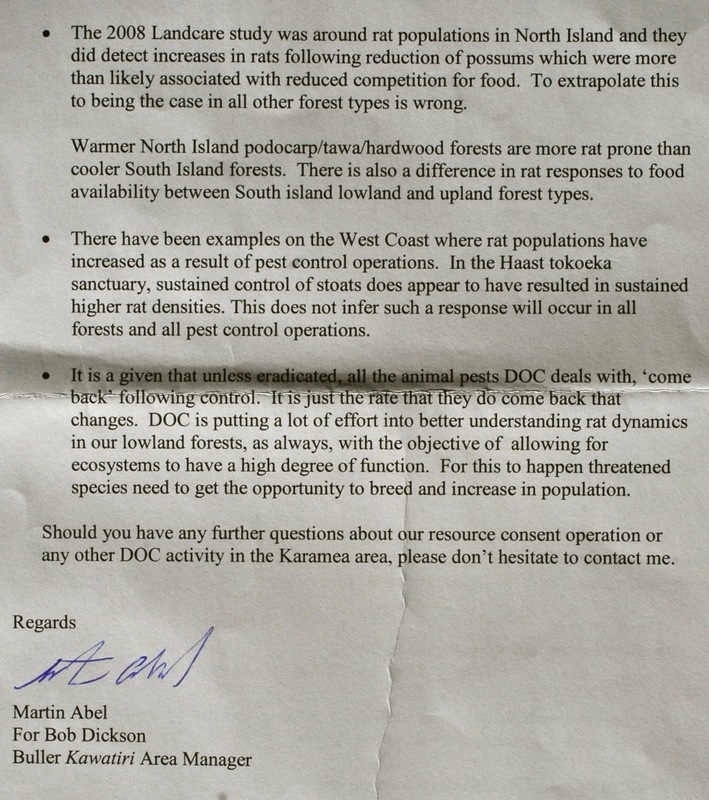 It would seem that the editor of The Listener had a quick read of the report by the Parliamentary Commissioner for the Environment Jan Wright and read her erroneous statement (or many of them) “…almost no pest control is done within the spectacular Kahurangi National Park…” and Chinese whispered that falsehood into a full-blown fabrication. The truth of the matter is that there has been a LOT of pest-control work in the Kahurangi, for example, in 2008 the Animal Health Board blanketed 54,000 ha around Karamea with poison, much of it in the park, the Department of Conservation has poisoned the Heaphy Track many times and has had an ongoing stoat trapping operation there for many years. DOC has a drop scheduled in the Kahurangi of over 20,000 ha this winter, so not only has there already been a whole lot of trapping and poisoning going on, it is on going. Perhaps the minister and the editor meant that there have been no effective pest-control operations in the Kahurangi National Park to highlight the fact that the many aerial pest-control programmes in the park have been ineffective and that the efficacy of the approach has been far less than expected? Or perhaps such false statements (and there are many others in both the report and the editorial) highlight the bias in the report toward supporting an unworkable Government pest-eradication policy at the expense of the very native fauna and flora the poison campaign is supposed to be protecting? The Wright Report is based on studies by the AHB and DOC and other government-sponsored analysis and ignores the many other independent scientific research papers on the subject that show a very different outcome to that required to substantiate Government policy. It is a farce of the top order, it is a fallacious document meant to sate the general public into believing that the government is doing everything it can to protect us from the perils of pests and their imminent threat to our environment and our sacred forests and birds. It is high time for a comprehensive study of the issue by an INDEPENDENT body without hidden agendas to thoroughly assess the subject of pest-control, the use of toxins, the impact of aerial pesticide use on the environment, tourism industry, agricultural exports, rural communities, the international image of New Zealand and to find a better way to address the challenge of protecting our land, forests and animals…this would be a far better use of public money than constantly trying to convince an increasingly aware public that blanketing the country with pesticide is a good idea. The Listener is well known as a servile mouthpiece for the Beehive (with the exception of Jane Clifton…go Jane!) This latest nonsense has finally convinced me (and many others I know) to cancel my subscription and start reading North & South for at least that publication exhibits the impartial, unbiased reporting requisite with good journalism. Apparently the complete elimination of all wildlife is paramount! I was of the understanding that New Zealand was a pristine tourist attraction! The broad-scale indiscriminate aerial distribution of 1080 poison over vast areas of New Zealand forest in the name of pest control is like bombing a city to destroy the criminals. AERIAL 1080 IS CLEARLY PART OF THE GLOBAL DEPOPULATION AGENDA, WITH A SUB-EXPERIMENT ON-GOING CONCERNING FLUORINE TOXICITY. O’Keefe observes that this kind of aerial deployment of deadly toxins has NEVER OCCURRED in history EXCEPT DURING WAR. Can a person visit the Heaphy Track and safely drink the natural stream and river water? The giant spotted kiwi is surely under serious threat of extinction if the Department of Conservation continues with this policy of wildlife destruction! No doubt about it…However, DOC will also claim that if they don’t implement pest-control measures the kiwis will become extinct anyway…but for the record, I’m not proposing no pest control, or even oppose the use of 1080 poison…I’m merely advocating that poison use be pest specific and not the indiscriminate, broad-scale, Cavalier aerial distribution of a very toxic pesticide I liken to bombing a city to kill the criminals. It is unacceptable that enormous numbers of native birds, invertebrates, insects, aquatic life etc be considered “collateral damage” in this ill-fated programme. It’s high time for a total rethink on pest-control in New Zealand and the government (with all the resources at its disposal) come up with a more focussed plan that is in line with the 100%Pure, Clean/Green brand that we use to promote the country internationally, so that New Zealanders can genuinely promote our country to overseas visitors and our agricultural exports as premium quality and “pure” with confidence and pride. Consideration needs also to be given to the rural people living in the pest-control regions who are rightfully concerned about the possible health implications of having a large amount of pesticide dumped where they live…aerial 1080 is a threat to the twin pillars of the New Zealand economy (tourism and agricultural exports). The New Zealand government is gambling with the future of the country and the coming generations with a short-sighted, poorly thought through and lazy policy. The N.Z. government, which manufactures the poison baits and then uses its agencies, councils and departments around the country to justify and promote the use of the pesticide, and recently has begun using the police force to deter protest against the programme is negligent in serving the needs of the country and the democratic rights of its people… the brave souls who are voicing their disapproval and seeking better solutions to the challenges of pest control are true patriots. Does 1080 give politicians 20/20 vision or a brain with an IQ 2/5 of 8/0? It makes them complacent and subsequently to avoid doing their job, which is to find a genuinely Clean Green 100% Pure solution to pest control…this is the responsibility of government as they have the financial resources of the nation to invest in such research…they currently lack the political will to do so…speak up New Zealand…demand better that aerial 1080 so that we can leave a legacy to our grandchildren’s children of beautiful balanced natural ecosystems, clean environment and so that we can genuinely promote our country and our premium quality agricultural exports to the international market with confidence and pride! Not only are a significant number of people on the West Coast opposed to this indescriminate poisoning of our eco-system but our objections meet with silence! Our objections are not met with silence, they are met with bureaucratic spin and subterfuge…see DOCs response to my letter…it’s a study in obfuscation! The West Coast Maori Iwi Runanga Ngati O Wae Wae has the inherited ability to prevent this 1080 drop. As protectors of the the forest, this includes all species, especially rare and endangered birds. As a tribal member of both Ngati Mamoe and Ngai Tahu I believe the elders are either extremely negligent or completely ignorant of the real extent of the proposed 1080 drop and the effect on wildlife. Muscles are easily flexed by Maori elders to receive government grants and compensation under the Treat of Waitangi! I appeal to the local iwi to “Save the Forest!” Tane didn’t give us beautiful native bush and abundant bird life for impetuous beauraucrats to completely destroy our inheritance! In the mighty forest, silence reigns supreme now! Bird life is danger of complete extinction! Tomorrow is too late to try and repopulate a barren wilderness! Agreed…stand up and protect Aotearoa!! Let’s think about our grandchildren’s children…and take a stand today for them! The forest life wasn’t great, but we did find a dead weka, dead tomtit, and dead grey warbler, the day after the drop. We also filmed robins and weka eating baits. We heard one Spotted Kiwi calling on the eve of the drop, but nothing after. There weren’t many deer in the drop zone, but on other drops we have filmed (many of them), we have found plenty of poisoned deer. We are revolted at how the DoC, regional councils, and the AHB can continue to ignore the horrendous way these animals, and many others, die. We conducted a necropsy on a hind that was poisoned on a Westland drop. She had been bleeding out of her eyes, her rear end, and there was extreme swelling all around the rear end of the animal. (This is common) When we investigated internally, we were disgusted at the amount of hemorrhaging that had taken place. The lungs were swollen and full of blood. The heart was the same. The bladder contained blood too. My brother Steve, who worked in the venison works and had butchered 1000’s of deer, had never seen internal damage like it. The DoC and the AHB, and their apologists, should be prosecuted for mass-scale animal cruelty! There’s no argument. What they are doing, and allowing to be done, is not only ecocide, it’s grossly inhumane and on a massive scale. When you take into account the extent of this atrocity (even tho hidden by the walls of the forest) – that 20,000 deer are poisoned every year (Dr Hugh Barr – Dr Charles Eason) – and hundreds of thousands of birds (Dr Whiting Okeefe – Poisoning Paradise) you start to realise that this isn’t about saving NZ’s wildlife – it’s about killing it. The PCE recently stated that MORE 1080 poison should be used, and that she and her lunatic supporters (DoC, F&B, Gareth Morgan, etc) would like to realise a “pest-free” NZ by 2050. You can start to understand how important it is that the legal-high products available at the corner dairies, must be stopped. It is clearly evident to me, that the organisations and people that support the increase of poisons dropped into the environment, and around your homes, are deluded and smoking too much K2! So the sooner that’s banned, the better. For those of you that are interested in understanding more about the poisoning of NZ, please visit http://www.tvwild.co.nz and vote on the various polls. Keep up the good fight Fellas! Just look at the battle of Balcombe for some inspiration. Stop the drop. Walking some 15 km through the forests of Oparara valley during autumn 2013, I couldn’t help but notice with sadness that I could barely hear any bird song throughout my excursion. I heard less than 10 birds sing. otherwise there was just silence most of the time. It’s evident much of the bird life has been killed. Should you care to express your sentiments as an international tourist to the man responsible for the perpetuation of the N.Z. government’s poison policy, please write to N.Z. Prime Minister John Key, who is also the Minister for Tourism. I hope the potential threat to the New Zealand tourism industry and the “Clean/Green,” “100%Pure” international brand of New Zealand will effect a change in government policy and a rethink on pest control in New Zealand. Thank you for reading my post and for your comment. True, true – On our July 2013 tramping trip of the Heaphy Track, completely unaware of this issue, Tony and I commented several times on how few birds there were, and how if it was an Australian track we would normally hear cacophonies of birdsong, especially come morning/evening. On day three, coming down towards the Heaphy River, a lone bird called out, and we mused that it was possibly the first bird we’d heard, till I remembered there had been one we’d heard on the first day coming up the mountain also! This question is a bit lazy, but as you have been in contact about this issue, and to save me some internet search time, is there any relevant way I could pass this small anecdote on to the authorities as an international tourist? Thank you for reading my post about 1080 poison use in New Zealand and my concerns over the environmental impact and the effect this government policy has on my business. As an international tourist and one of my lovely customers, I suggest you go straight to the top. New Zealand Prime Minister John Key is ultimately responsible for the perpetuation of 1080 poisoning of our national parks, he is also the Minister for Tourism, so if you’d like to relay your observations to him, perhaps he will finally realise the damage the poison programme is having on the environment and also the important tourism industry…not to mention the reputation of New Zealand as “Clean/Green” and 100%Pure. You’ll likely receive a letter like the one I got in reply to my letter to the Department of Conservation, which is a study in public relations subterfuge! Thanks again for taking the time to read my stuff and comment….and thanks for staying with us! Thanks Paul Murray for the huge amount of work you have done fighting this evil of Aerial 1080. I decided to make Karamea my home 40 years ago. I hunted possum for 8 years in the areas that have been Aerially poisoned so I know what the wildlife aaas like before 1080. I often camped overnight, more pork and kiwi were common in the Oparara, not any more. A family of Kaka lived in the Oparara basin. They have gone. The family of Kea that entertained me on the Karamea Bluff Road (Karamea Ecological Reserve) disappeared after the first Aerial 1080 Poisoning about 1980. My complaints to DoC and Federated Farmers were ignored. I was told Aerial 1080 was simply a marketing exercise to ensure access of Dairy products to overseas markets and that farmers didn’t care if a few birds had to be sacrificed. Enough is enough. This Ecological Insanity must stop. It is morally indefensible and breaks all the rules about responsible and sustainable living. Planet earth is but a Global Village and the rest of the world will not remain silent and let a small group of Eco Fundamentalists practice Wildlife Apartheid and Ecocide in New Zealand. I quite agree Jim and thank YOU for your tireless efforts to bring this issue to public attention and seek a better national pest-control policy that is more in line with the conservation that is claimed but not honoured.